As we approach the grand finale, we recap weeks 1-8 at Privilege on Tuesday with our favourite images. After eight intense weeks featuring an array of superstars, RESISTANCE's second season on Ibiza has been an over-qualified success story. 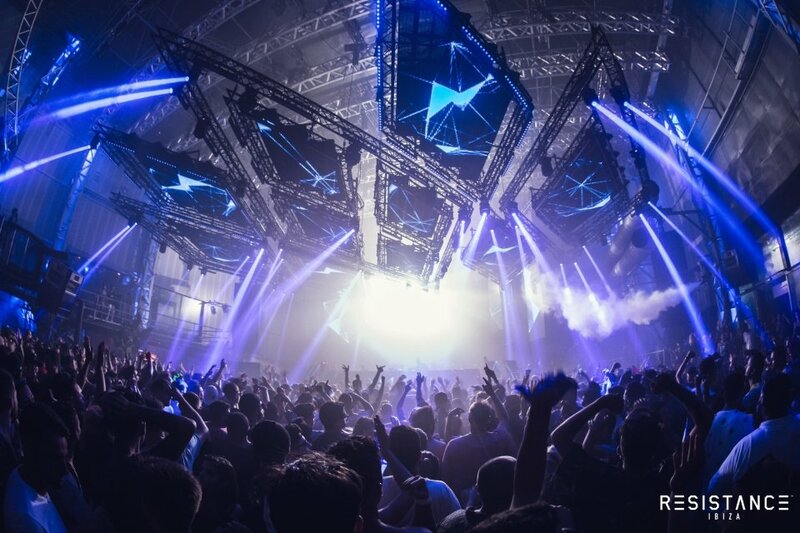 Building on the foundations of last year which saw a certain Carl Cox drafted in for three dates, Ultra's underground party behemoth truly maximised Privilege's assets. Ground-breaking production, pumping dance floors and bone-rattling music have been the rule. The Uprising is complete. As we hurtle towards the gripping closing party this coming Tuesday 11 September, we recap on the moments that made the season from Week 1 to Week 8. Any excuse to visit Café del Mar and experience the energy as day turns to night is an opportunity not to be missed. Throw in an appearance from one of the RESISTANCE roster and you have pre-party heaven. RESISTANCE got the party started early on the sunset strip. Guests throughout the summer included Eats Everything, Paco Osuna and Matador, with resident Ken Fan steering the ship weekly. Josh Wink graces the legendary venue tomorrow. Those of you based on the opposite side of the island, need not feel left out. Playa d'En Bossa hang-out Tantra activates party mode nice and early. Now we could tread old ground by pouring over Carl Cox's lengthily love affair with Ibiza, but you know that already. Part of that special relationship has been Carl legendary birthday celebrations. In previous years we've seen back-to-backs with Loco Dice at Space and funk, soul and disco beach soirees at Sands. 2018 at RESISTANCE saw Coxy reunited with good friend Nic Fanciulli for an early b2b in Vista, reminiscent of their fabled Space closing duels. Later, one Jamie Jones laid the foundations in the main room before the birthday boy rocked the cavernous dance floor. Broadcasting live from Metrica Recording Studios and simulcast on Ibiza Sonica Radio, RESISTANCE sent a conveyor belt of talent to showcase what the party was all about from 19:00. Tuesdays really did feel like they had everything: radio, pre-parties and then the main event - did anybody say "Afters"? Locking in last year's weekly residents exclusive for a second consecutive year should be considered a giant coup. The reunited pair were pivotal in announcing RESISTANCE's arrival on the island in 2017. But the decision to give them extended sets on the Terrace for three dates this summer has been an inspired piece of programming. Bravo RESISTANCE. All we need now is a Sasha & Digweed all-night-long marathon. Maybe in 2019? Please. The glory days of ENTER. seem like a distant memory. Never one to dwell on past achievements, Richie Hawtin is always eager to break new frontiers. Times change and only the most adaptable survive, and few industry figureheads evolve like the Canadian techno deity. Digital formats courtesy of the Model 1 mixer and its ambassadors took over the main room, while analogue formats looked after things on the Terrace. This meant a bridging of two worlds and two times. An abundance of female talent in Room Two also served to make this one of the few female heavy line-ups of the entire season. Kudos for that, Mr Hawtin. Aside from the duos that already come as a package - such as Pan-Pot and the aforementioned Sasha & Digweed - RESISTANCE has thrown together some truly memorable fantasy pairings this summer. Take Eats Everything back-to-back with Patrick Topping from this past week - or ANNA b2b Francesca Lombardo in Week 3. Plus, we still have the small matter of Josh Wink and Butch to come at the closing. … and then there was even the return of the infamous back-to-back-to-back between Nicole Moudaber, Dubfire and Paco Osuna that got such rave reviews at last year's closing. Epic. Countless requests down the year for Adam Beyer's Swedish techno imprint to have a presence on the island were finally answered in 2018. Unbelievably, Drumcode takeover of Week 4 was the label's first forage on Ibizan soil. A nucleus of stars from Drumcode's alumni formed proceedings on this landmark night: Ilario Alicante, Enrico Sangiuliano, Layton Giordani and Drumcode's First Lady Ida Engberg. It was the closing back-to-back between Beyer and Joseph Capriati that stole the show. Podium dancers wearing LED visors, soaring trapeze artists and state-of-the-art UFO-shaped lighting rigs that moved in sync with the music. You would be forgiven for thinking RESISTANCE had stolen technology straight from NASA. All this festival-scale production, alongside colossal CO2 cannons, that top-notch Funktion One sound system and the darkest, space-age techno in the universe. RESISTANCE made its mark felt. Few parties post-event marketing exceeded the efforts of RESISTANCE. Week after week, we were treated to viral videos that were not only incredibly edited but also encapsulated the energy of the dance floor. Best of all, the included footage was shot on location from our favourite parts of the island. See if you can spot yours. This promo campaign made the hairs on the back of our neck stand on end and meant that RESISTANCE was never off our agenda. The music - this last one speaks for itself. We have selected a handful of recurring tracks that have shaped the sound of RESISTANCE 2018. Easily one of the tracks of the season - and one we heard multiple times at RESISTANCE in 2018. CamelPhat of Cola-fame, proving they can mix it up with harder sounds. With Maceo Plex himself in attendance at the closing, we're gearing up for a replay on Tuesday. Intrigued? Then you can listen and subscribe to our dedicated RESISTANCE Ibiza Spotify playlist below for a more rounded impression of what was played weeks one to eight. Only the music that we heard out is included - so this is a genuine reflection of how things went down. Where did eight weeks go already? Join the RESISTANCE crew for one gargantuan closing party tomorrow on Tuesday 11 September. King Carl Cox leads the front line and he is in some very good company with Sasha & Digweed and Patrice Bäumel backing him up. Maceo Plex also makes his only appearance for RESISTANCE with a world exclusive b2b with Coxy. Meanwhile Dense & Pika, Skream and Popof join Josh Wink and Butch on the Terrace. RESISTANCE is going out with a blast. The last remaining tickets can be found below - and this is a party you really do want to attend.